October 16, 2018 • Page 8 shop online at www.missourivalleyshopper.com In SD, It’s Native Americans’ Day By Gov. 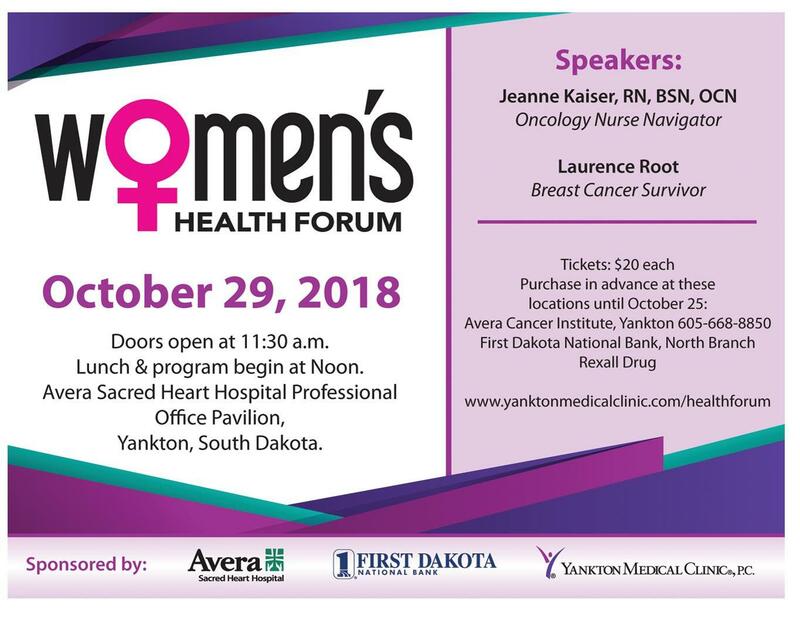 Dennis Daugaard If you look at your calendar, I’ll bet on Monday, Oct. 8, it says “Columbus Day.” Though the designation may serve as a good reminder for those who don’t have school that day or whose offices are closed, it’s not quite accurate for those of us in South Dakota. Here, it’s Native Americans’ Day. The change came at the urging of Gov. George S. Mickelson in 1990 as part of his “Year of Reconciliation” efforts, making us the first state in the nation to establish Native Americans’ Day as an official state holiday. Given that nine tribes share our borders and about 9 percent of our population is Native American, I’d say it was a fitting alteration. This Native Americans’ Day, I’m reflecting on our state’s progress toward improving relations with tribal members. It’s something I’ve tried to prioritize during my time in office. In 2011, I established the Department of Tribal Relations as a cabinet-level agency within state government and named J.R. LaPlante as the first-ever Secretary of Tribal Relations. J.R. and I initiated annual tribal visits in order to meet with tribal presidents and council members to better understand the specific issues affecting each tribe. This was something we continued under Secretary Steve Emery’s leadership as well. The Department of Tribal Relations has worked diligently to facilitate partnerships among state agencies and the nine tribes. For instance, we have tax collection agreements with eight tribes and also gaming compacts with eight tribes. In 2016 and 2017, the Department of Game, Fish and Parks signed cooperative Memorandums of Understanding with the Lower Brule Sioux Tribe, Rose- bud Sioux Tribe, Oglala Sioux Tribe, and Flandreau Santee Sioux Tribe to improve communication and management of wildlife and lands. And the Department of Environment and Natural Resources has dedicated millions of dollars for the operation and maintenance of tribal drinking water systems. The Department of Tribal Relations has also held annual trainings to encourage tribal participation in the legislative process. I signed a bill exempting elected tribal leaders from registering as lobbyists before testifying for or against legislation. We have been successful at passing other tribal legislation as well. This year I signed a measure that allows tribes to work directly with counties on extradition, rather than going through the state, as well as a bill authorizing tribal law enforcement officers to utilize the state Law Enforcement Training Center. On the corrections front, we have implemented a very successful tribal parole program with the Sisseton Wahpeton Oyate. Part of the Criminal Justice Initiative of 2013, the program returns parolees to their tribal communities where family and community supports encourage compliance. This joint supervision program has resulted in higher parole completion rates, fewer instances of absconding and culturally relevant support systems for parolees returning home. Relations between the tribes and the State of South Dakota have improved over the last several years. It’s normal to have diverse viewpoints and some disagreements, but we continue to move in a positive direction. 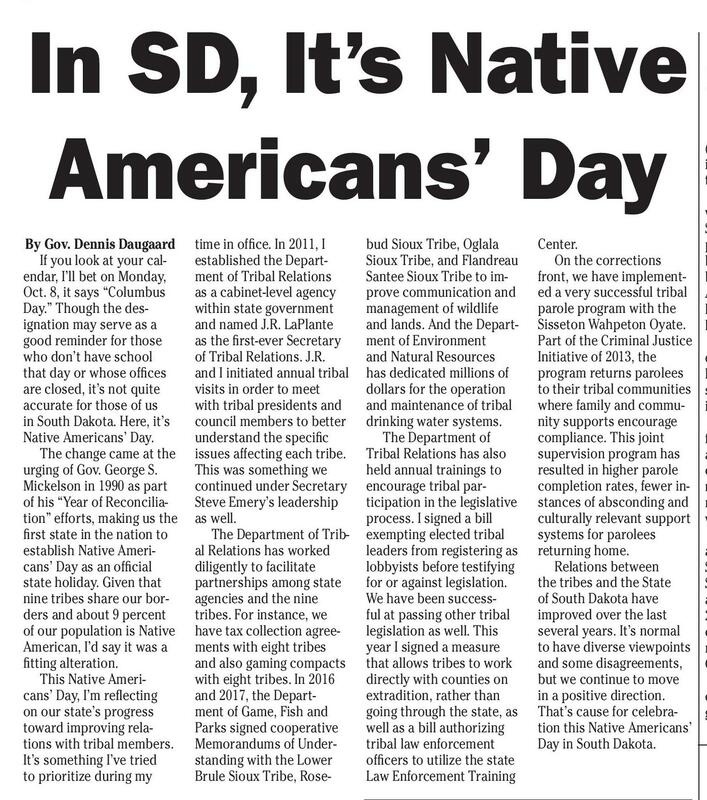 That’s cause for celebration this Native Americans’ Day in South Dakota. The Classifieds: AUCTIONS Your Ticket to Local Finds Call or go online to browse, buy or sell! In Print and Online! 665-5884 • www.missourivalleyshopper.com Social Security Announces 2.8 Percent Benefit Increase For 2019 Social Security and Supplemental Security Income (SSI) benefits for more than 67 million Americans will increase 2.8 percent in 2019, the Social Security Administration announced today. The 2.8 percent cost-of-living adjustment (COLA) will begin with benefits payable to more than 62 million Social Security beneficiaries in January 2019. Increased payments to more than 8 million SSI beneficiaries will begin on December 31, 2018. (Note: some people receive both Social Security and SSI benefits). The Social Security Act ties the annual COLA to the increase in the Consumer Price Index as determined by the Department of Labor’s Bureau of Labor Statistics. Some other adjustments that take effect in January of each year are based on the increase in average wages. Based on that increase, the maximum amount of earnings subject to the Social Security tax (taxable maximum) will increase to $132,900 from $128,400. 1. Security and SSI beneficiaries are normally notified by mail in early December about their new benefit amount. This year, for the first time, most people who receive Security payments will be able to view their COLA notice online through their my Security account. People may create or access their my Security account online at www.socialsecurity.gov/myaccount. Information about Medicare changes for 2019, when announced, will be available at www.medicare.gov. For Social Security beneficiaries receiving Medicare, Social Security will not be able to compute their new benefit amount until after the Medicare premium amounts for 2019 are announced. Final 2019 benefit amounts will be communicated to beneficiaries in December through the mailed COLA notice and my Social Security’s Message Center. The Social Security Act provides for how the COLA is calculated. To read more, please visit www.socialsecurity. gov/cola. State Fair Numbers Continue To Climb Huron, SD – South Dakota State Fair numbers continue to climb as attendance at the 2018 South Dakota State Fair was 217,231, up 2.5 percent over last year, while gate revenue increased by 3.6 percent. “This was an exciting year for us. We invited people to come experience the fair’s magic and that they did! Our strong entertainment line-up, headlined by Toby Keith, set the mood for the fair and the rest just fell into place,” said Peggy Besch, South Dakota state fair manager. “Of course, the weather was on our side too! It was fun to see the crowds, especially on the A Must Have For That Bin Site, Workshop Or Calving Barn! The most fuel efficient space heater on the market! Delivering wet grain to town can mean TOO much SHRINK & TOO much drying CHARGE. So Whether... AUCTION Saturday, Oct. 27 -- 11 a.m. 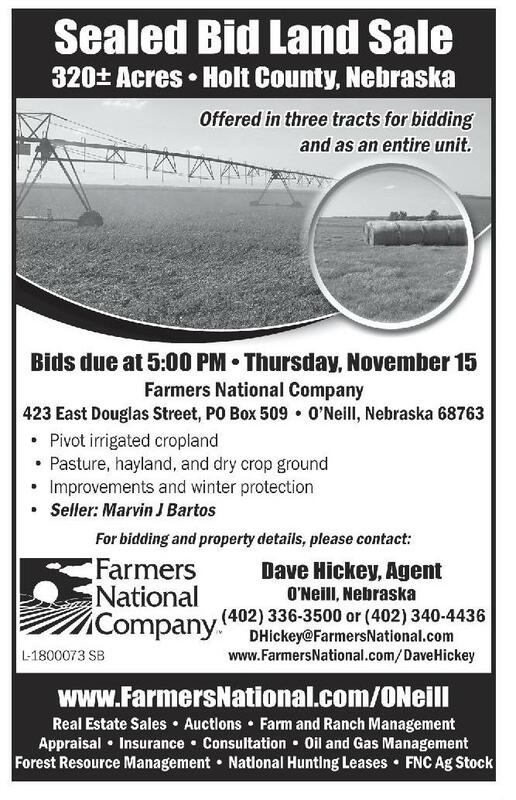 LOCATED: 42659 307th Street, Tabor, SD from Tabor 1/2 mile south and 1/4 mile west TRACTORS - MACHINERY: IHC 504 gas, n.f., 3 pt, fenders, new rubber, nice; IHC 350 gas, n.f., fast hitch; M Farmall w/ Farmhand F-10 loader; H Farmall and loader; J.D. AW disc; IHC 7’ mower; ?are box wagons; 3 pt blade; straight disc. GUNS: Rem. 870 Wingmaster 12 ga. pump, 3”, vent rib, like new; Rem 700 BDL bolt act. .243 w/ weaver 4x scope; like new; Browning BLR .22, like new; Savage 87A .22 auto TOYS - ANTIQUES - COLLECTIBLES: Several Ertyl toys, most NIB including IHC 350, M, H, A, B, & F-20 tractors; Golden Sun semi; Millenium case steam engine; Waterloo Boy; 9120 combine; Catepillars; old Structo tin truck; model trains; ships; Gene Autry gun and holster set; oak drop front desk; parlor table; oak rocker; commode; large oval mirror; Cattaraugus Knife display cabinet; huge stamp collection; IHC operators manuals; lots of books and literature of every description; IHC Honner items; advertising items; Kerosene lamps; barn lanterns; rinse tubs; enamel items; collectible glass; Playboys; red wagon; cistern cups; cast iron items; RR sign; old tools plus much more yet to be uncovered LAWN - GARDEN - SHOP - MISCELLANEOUS: J.D. X304 18 1/2 hp 42” all wheel steer riding mower; DR push string mower; mower lift; rear tine tiller; lawn wagon; 12V sprayer; Stihl gas trimmer; leaf blower; dandelion roller sprayer; air compressor; table saw; elec chain saw; shop vac; elec power tools; angle grinder; etc. 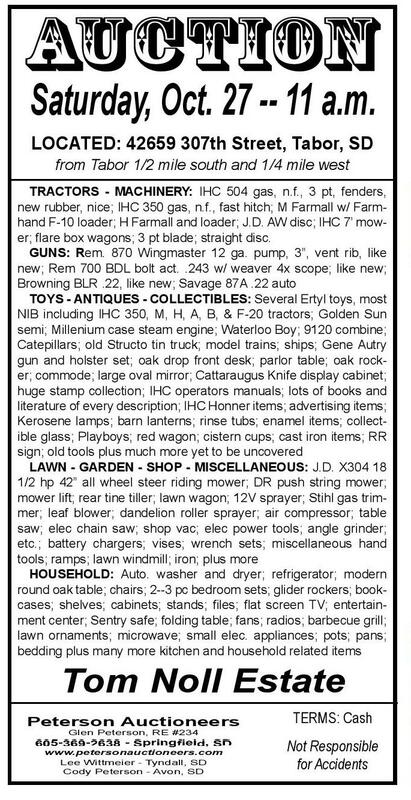 ; battery chargers; vises; wrench sets; miscellaneous hand tools; ramps; lawn windmill; iron; plus more HOUSEHOLD: Auto. washer and dryer; refrigerator; modern round oak table; chairs; 2--3 pc bedroom sets; glider rockers; bookcases; shelves; cabinets; stands; ?les; ?at screen TV; entertainment center; Sentry safe; folding table; fans; radios; barbecue grill; lawn ornaments; microwave; small elec. appliances; pots; pans; bedding plus many more kitchen and household related items Tom Noll Estate Peterson Auctioneers TERMS: Cash www.petersonauctioneers.com Lee Wittmeier - Tyndall, SD Cody Peterson - Avon, SD Not Responsible for Accidents Glen Peterson, RE #234 • Your drying bin equipment is down & you can’t get it repaired • You’re thinking that typical bin drying is taking TOO MUCH PROFIT! 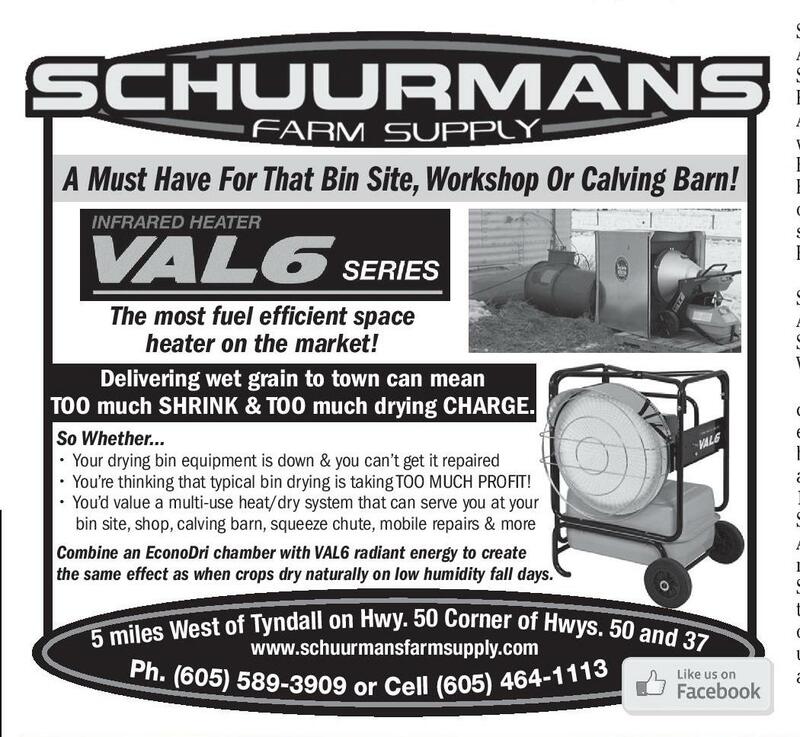 • You’d value a multi-use heat/dry system that can serve you at your bin site, shop, calving barn, squeeze chute, mobile repairs & more Combine an EconoDri chamber with VAL6 radiant energy to create the same effect as when crops dry naturally on low humidity fall days. of Tyndall on Hwy. 50 Corner of Hwys. 50 and 5 miles West www.schuurmansfarmsupply.com 37 Ph. (605) 5 89-3909 or Cell (605) 464-1113 weekend.” Other increases include a 13 percent increase in grandstand ticket sales, while grandstand ticket revenue was up 56 percent. Carnival revenue was up 7 percent. Gross sales from vendors were up 2.8 percent. The South Dakota State Fair hosted 1,984 campers, up 1.5 percent over last year. Participation in youth activities remained strong as 4-H livestock exhibits were up 3 percent, while 4-H Youth in Action increased by 24 percent. A 14 percent increase in FFA exhibitors led to a 32 percent increase in FFA entries. The 2018 South Dakota State Fair was held Thursday, Aug. 30, through Monday, Sept. 3. Channel Seeds Preview Day was Wednesday, Aug. 29. This year’s theme was “Experience the Magic.” For more information on State Fair events, contact the fair office at 800.529.0900, visit sdstatefair.com or find us on Facebook or Twitter. The 2019 South Dakota State Fair will be Thursday, Aug. 29, through Monday, Sept. 2, with preview day on Wednesday, Aug. 28. Agriculture is a major contributor to South Dakota’s economy, generating $25.6 billion in annual economic activity and employing over 115,000 South Dakotans. The South Dakota Department of Agriculture's mission is to promote, protect and preserve South Dakota agriculture for today and tomorrow. Visit us online at sdda.sd.gov or find us on Facebook, Instagram and Twitter.